We are supplier and manufacturer of a wide range of Ultrasonic Sm 140 US. Made of exceptional sturdy materials, these machines conform to strict quality standards. Ultrasonic Cleaning Equipment converts the oscillations to vibrations with the help of a mechanical generator. These vibrations produce intense scrubbing action throughout the liquid media which in turn pulls out the contaminants from hidden recesses and crevices of complicated assemblies. Ultrasonic also accelerates chemical action of the cleaning media (Water and Solvents). 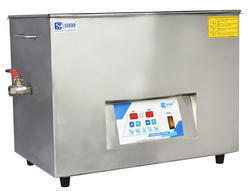 Looking for Ultrasonic Cleaning Equipments ?